So… I’m learning how to be a skipper, it’s a long haul, and there’s really nothing super exciting about it except for sailing a lot and learning navigation and so on. I’m doing this in Israel, in a school called Yam-Sailing (English Link) (highly recommended) with my Instructor Roni Cohen. When I started (a month ago) Roni warned me that we better get the navigation chapter done (i.e. I should learn and pass the navigation test) as soon as possible, before January 1st 2010. 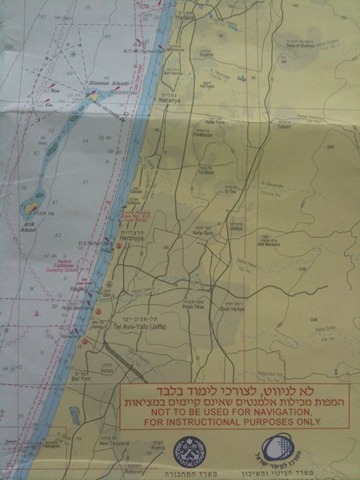 The reason for this was because someone in the Israeli sailing association, which is responsible for testing the would-be-skippers, decided it would be a great idea to switch from learning navigation on the English Channel to a map of Israel. After all, what’s wrong with some local partriotism.. right? right!?!?! The English “translation” doesn’t do it justice. ~ by damageboy on November 25, 2009.